Neither I, nor anyone in my firm: (1) sue consumers on consumer debt; (2) advise businesses regarding debt collection or evictions involving consumers, or (3) represent landlords in evictions. Neither I, nor anyone in my firm, defend any clients against FDCPA, TCPA, FCRA, or other consumer claims. In the previous 5 years, I have not engaged in any of the activities described in the two preceding certifications, or I have sent a written explanation to conference@nclc.org of any such work in the past 5 years. I do not handle debt settlement matters, or if I do represent clients in debt settlement affairs, I do not engage in any disqualifying conduct. 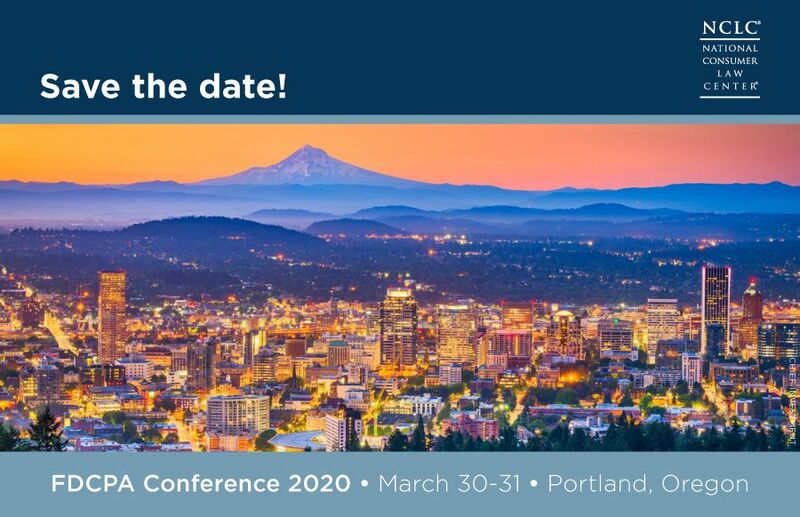 * Non-attorneys who wish to attend should email conference@nclc.org with information about your occupation and interest in attending the conference. If you are interested in joining the 2020 Host Committee, please contact Paul Laurent or call 617-542-8010.